2 flute flat bottom cutters. 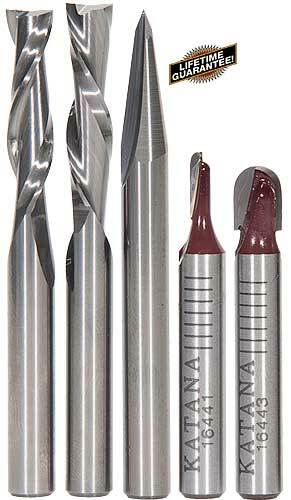 Premium grade and superior quality micrograin solid carbide cuts faster and smoother and stays sharper longer. Upcut spiral helps remove material. Ideal for making mortise and tenon joints. 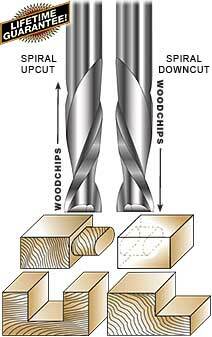 Downcut spiral helps hold the material in place while using handheld routers. Will plunge cut and plane edges. Eliminates chipping at the top of the cut. Ideal for soft & hard woods, plywoods and composites, laminates, plastics and some non-ferrous metals. 1/4" and 1/2" shank. Our customer Gordon B. said... "Just thought I would let you know I love the 1/2 inch KATANA Solid Carbide Spiral Router Bit. I have been using it on some very tough IPE. Cuts like a charm. Smooth, clean cuts and does not grab the wood. It is a pleasure to use. Glad I bought the set of three." SAVE $20! 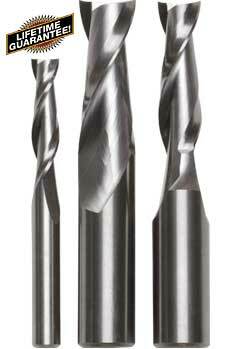 Includes three Katana® solid micrograin carbide spiral bits that cut fast and smooth with an edge that stays sharp longer. These Upcut router bits are ideal for making mortise and tenon joints. SAVE $20! List price $119.85. 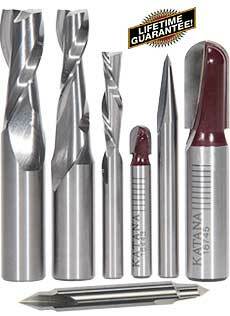 Just thought I would let you know I love the 1/2 inch KATANA Solid Carbide Spiral Router Bit. I have been using it on some very tough IPE. Cuts like a charm. Smooth, clean cuts and does not grab the wood. It is a pleasure to use. Glad I bought the set of three. NEW! 2 flute, solid carbide Up-Down-shear design cuts toward the center from both sides at once, for clean cuts in sheet goods. I was previously using two-flute upcut router bits but was burning them and my material had a lot of tearout. This compression bit is smooth and it leaves both sides of my plywood clean- cut and ready for finish work. For cnc work, this bit is awesome! 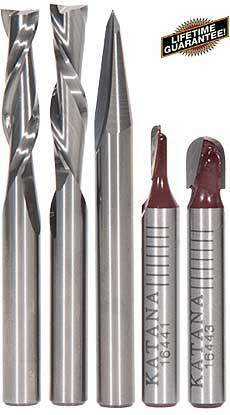 Premium micro-grain carbide 5 piece set! SAVE $14! Includes all five 1/4" shank router bits. List $98.85. 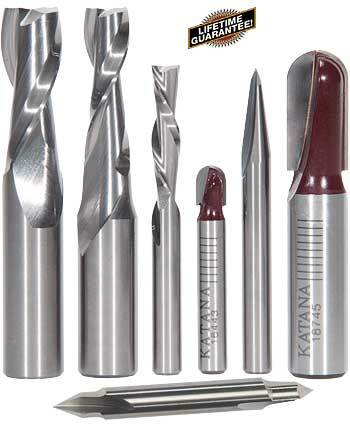 Premium micro-grain carbide 7 piece set! SAVE $27! List price $211.75. Includes seven 1/4" and 1/2" shank router bits.